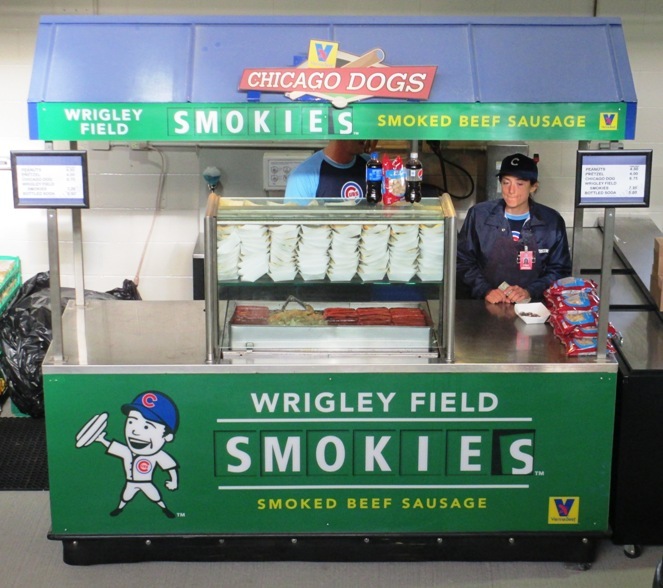 Did you know that there are at least five varieties of hot dogs and sausages at Wrigley Field? I don’t mean just different toppings…I mean five very different Wrigley Field hot dogs and sausages stands, and that’s not counting the Sheffield Counter or the basic generic dog. And they’re all great in their own way. Here’s what you should know…read this whole thing, truly. I was too hungry to provide an “after” picture with the necessary condiments included. 1) Chicago Dogs. The nicely-sized Chicago dogs are Vienna Beef (yes, they’re all-beef) dogs on poppy seed buns, with grilled onions if you so desire. There are condiment stands with all the toppings to make it a true Chicago dog…chopped tomatoes, sport peppers, mustard, sauerkraut and neon green relish. I believe they have the celery salt too. Great for seeing what this Chicago hot dog stuff is about. OK, so maybe it needs some work with pepper distribution. 2) High Plains Bison Dogs. High Plains is the Official Lean Meat of the Chicago Cubs; they have dogs, sausages and brats here made from leaner bison meat. 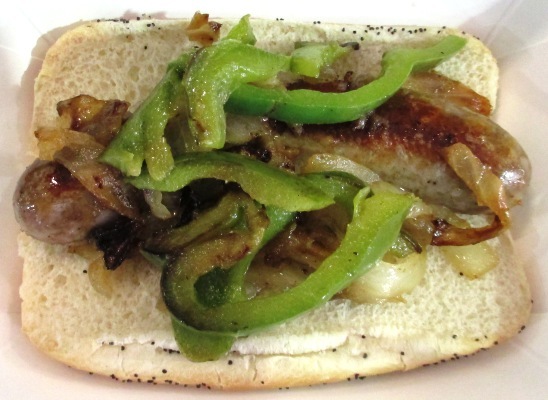 Tastes just like a beef dog but leaner, and you can pile on peppers, onions and marinara. Made with Vienna Beef? Whew! 3) Wrigley Field Smokies. The Cubs brought back the popular Vienna Beef smoked sausages from the Tribune days (and without the 100-loss seasons! ); they are hickory-smoked beef sausages with a secret blend of seasonings. The Smokies cost a bit more than regular dogs but are larger, and you can order them in Wrigleyville supermarkets. No, it doesn’t come with the onion. At least as far as I know. 4) Gilbert’s Craft Sausages. Gilbert’s is the Official Sausage of the Cubs; they’re craft sausages that are gluten-free and contain no MSG or nitrites. 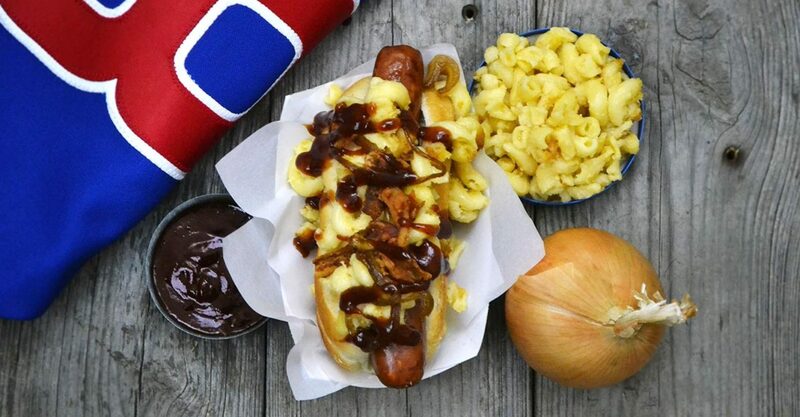 There are several types of sausage sandwiches here, like the Caprese chicken sausage with diced tomatoes, basil and mozzarella, or the Beef and Cheddar with mac and cheese, bacon, caramelized onions and BBQ sauce. If you want to learn more about this one, you can read the review from my buddy Danny Rockett at Bleed Cubbie Blue. He’s got a high standard for ballpark food, so you know his raves count for something. With a logo like this, you know it’s a great dog. 5) Last but definitely not least: Hot Doug’s. The enormously popular Hot Doug’s cart closed up shop, but Doug Sohn’s amazing red hots are now available in the Wrigley Field bleachers; lines get long and for good reason. 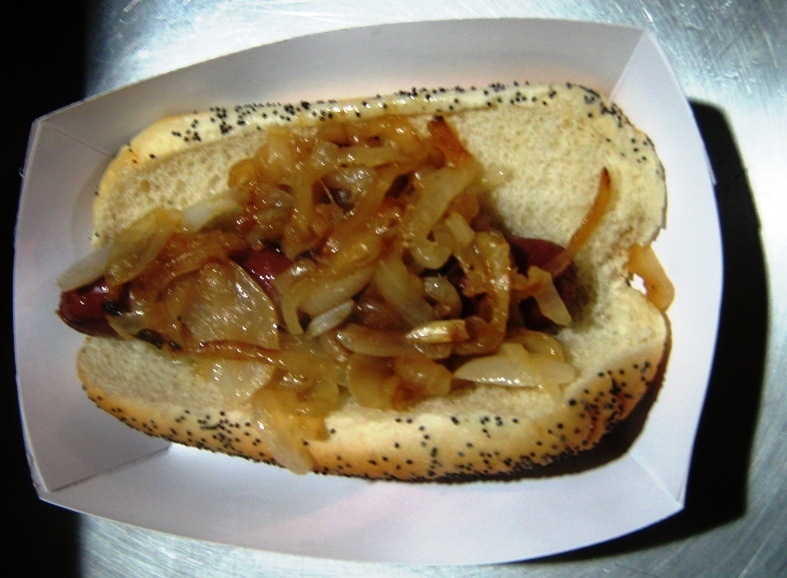 Dogs are named for Cubs greats; the the “Barry Foote” is a corned beef sausage with Russian dressing, shredded Swiss and sauerkraut; and the “Champ Summers” is a spicy Polish sausage with Goose Island beer mustard and crispy fried onions. Hot Doug’s rotates different dogs for each homestand, and there’s always something unusual. There’s your five choices of Wrigley Field hot dogs and sausages; not surprising considering that Chicago worships the hot dog. But there’s much more for you to much on at Wrigley, like Giordano’s pizza and Joe Maddon hoagies…not to mention the offerings at the Sheffield Counter and Platform 14. Gilbert’s photo courtesy of Gilbert’s. Hot Doug’s logo courtesy of Hot Doug’s. Want to know more about the Friendly Confines? Sign up here for my completely free Wrigley Field e-mail newsletter series, and score some seriously valuable info about tickets, seating, transportation and food…see you at the Yard! Enjoying the cool Wrigley tips? Sign up today for the absolutely free Ballpark E-Guides Wrigley Field newsletter!